One of the fascinating things to do in a rocky shore study is to observe how various creatures have adapted to their own niche (corner, specialty) on the intertidal rocky shore. In this page we'll look at the various methods of feeding and how to do a rocky shore study. Although the rocky intertidal is not a closed ecosystem, due to the vast open sea bordering it, one still finds all methods of feeding here. 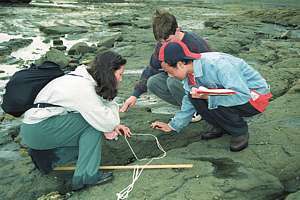 Tips for doing a rocky shore study. Begin your study of the sea at the Seafriends home page or our sitemap. Note! for best printed results, read tips for printing. For suggestions and comments, please e-mail the author. The whole section covers about 6MB, including text, drawings and over 300 photographs. Buy our CD or make a donation. 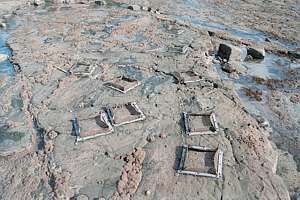 The intertidal rocky shore is dominated by strong sunlight, so grazing is expected to be its main feeding activity. But the open ocean supplies an unlimited amount of plankton and surface scum. The incoming tide brings the surface of the water, which is rich in living and dead organisms, to every part of the intertidal rocky shore - a defining moment for filter feeding and straining. Most grazing is done by molluscs (snails, limpets, chitons, sea hares). The most voracious grazers are the black nerita, grooved topshell above water and the catseye under water. Under low tide, even more hungry grazers exist: abalone/paua and cook's turban shell. The grazing by tiny shells cannot be underestimated because of their sheer numbers. Molluscs do not have fixed shapes, so they are able to adapt to the form of the rock, extending their mouths right out to graze in small places. All molluscs have a powerful utensil in the form of a hardened tongue or radula. This radula is grown continuously from one end as the business end wears down. Grazers have small teeth on their radula, used for scraping algae off the rock. In whelks the radula serves to drill down into meat or combined with acidic saliva, to drill holes through shells. Some tropical snails like cone shells can sting other organisms with a deadly poison. 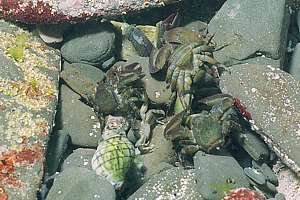 But there are other grazers like some crabs (red rock crab, camouflage crab). The most important grazer is the sea urchin (Evechinus chloroticus) who operates under water but moves higher up when the tide is in by night. The sea urchin also catches broken seaweeds that float by. When the tide is in, a number of grazing fish move in like parore (Girella tricuspidata), marblefish (Aplodactylus arctidens). Grazing by fish is particularly important in coral reefs. Important grazers are also the myriad tiny amphipods hiding in the coralline turf and under sea urchins. Filterfeeding is a form of grazing as it involves catching phytoplankton (plant plankton). The most important filterfeeders of the intertidal are the flea mussels and any larger mussels, as well as oysters. They all benefit from living near the surface of the sea where planktonic food is plentiful. There are less important filterfeeders like seasquirts and sponges. The word straining is used here to make a distinction between filterfeeders who are able to catch the smallest particles in the plant plankton and those who catch the larger particles. The most important strainers are the barnacles (brown, columnar, sheet, plicate) and even though they are out of the water most of the time, are nonetheless able to grow fast and to reproduce profusely. Less important strainers are the porcelain crabs who catch coarse planktonic particles with sieves on their mandibles, and plankton hermits who do it with their antennas. Anemones catch planktonic particles with their stinging harpoon cells. Detritus is any form of food raining down from the plankton, including dead organisms. Detritus is swept into deep rock pools and under stones where most detritivores are found. Detritivores live under water. Under stones one finds the various brittle stars that are able to mop up detritus with their sticky arms. An important detritivore is the sea cucumber who mops it off the rocks with ten sticky mops in its mouth. 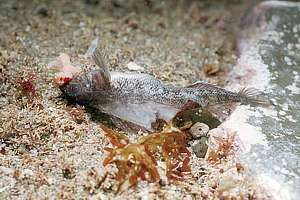 In New Zealand the parore is also a substantial detritivore as it scrapes the rocks clean. In the sand one finds the bungee worm (Amphitrite spp) who extends dozens of tentacles far out, mopping up all detritus around it. Perhaps the most important detritivore is the cushion star (Patiriella regularis) who is also a potent scavenger, grazer and at times predator too. It is omnivorous because by extending its stomach outside its body, it can eat large meals, no matter what. Grazing is typically done by few species but their numbers are high, whereas predation is done by many species but their numbers are low. Amongst the snails, the important predators are the dark and white rock whelks (Dicathais & Haustrum spp) and the oyster borers (Lepsiella scobina). But every fish, starfish and crab is also a predator. Sub-tidally there are many more predating whelks and other predators, which at high tide may visit the intertidal zone. Scavenging is the act of eating dead organisms. Because a hunt and a kill are not necessary, scavenging is a very worthwhile and economic strategy if one can last the uncertain time between meals. Scavenging whelks and starfish can do this with ease. They have a very sensitive sense of smell and can move relatively fast towards the wounded or dead animal. Predators do all they can to prevent scavengers from sensing their kill. Scavenging whelks use their proboscis with radula to drill into the dead animal, such that several whelks can share the meal. But cushion stars are more selfish as they try to blanket the meal with their entire bodies. Other scavengers are the many crabs, worms, sea lice and more, and they all get their turn until nothing is left. Whoever visits the rocky shore, whether adult or child, comes with a very limited knowledge of the shore and the sea. There is very little time to teach, to digest and to remember. So WHAT we teach is not as important as HOW we teach. So what do we wish children to take home? a sense of amazement - wow! the sea is very different from the land. It is weirder than one can imagine. the shore is rich; there is unexpectedly huge biodiversity. what is marine conservation? The rocky shore is only a very narrow strip, potentially threatened. marine reserves do not protect against pollution and degradation. going bare foot to prevent limpets from being crushed. Once they bleed, they bleed to death because their blood does not have a clotting agent. after turning stones, returning them precisely to their original position while doing this with care. Do not turn every stone but learn the most from the ones turned. not stepping on seaweeds because this damages them and it could be a camouflage crab. After many years of diving and studying the sea, I discovered that the most important thing to learn about the sea is its weirdness. It is stranger than one could possibly imagine. Almost none of the ecological laws that apply on land, work in the sea. So we need to learn entirely from scratch. I think that our mismanagement of the sea stems from our failure to acknowledge that the sea needs its own understanding. We seem to make only mistakes as far as the sea is concerned, and this web site documents this failure extensively. Understanding the weirdness of the sea makes us understand the land even better. So where do you begin? Our chapters on biodiversity, marine conservation, introduction to habitats, degradation, the Plankton Balance and the DDA, give you a good grounding, even though the latter two have not been confirmed by mainstream science. The weirdness of the sea is totally amazing, also reflected in its many life forms. zoning: caused mainly by the tide and wave action. differences between sea and land: breathing water, being cold blooded, plants not in the sand but on the rocks. natural threats to life: suffocation, drying out, overheating, freezing, waves. unnatural threats to life: being killed by treading, turning stones, degradation, sediment, pollution. survival methods: survival package, going on stand-by, huddling, homing, hiding. competition: for space, for food. feeding: grazing, predation, scavenging, detritus-feeding, filter-feeding. body forms (phyla). This is particularly interesting for the younger students: shells, crabs, starfish, sponges. about marine reserves and the locality: the sea here is protected no taking or killing marine life. You cannot take shells, not even sand. You cannot feed the fishes either. f960803: college students 'doing science' with transects and quadrats while identifying creatures and counting them. But a rocky shore study without slate and pencil should have been done before, introducing the many environmental factors and principles. f009615: scientific inclusion and exclusion experiments with open cages on barren rock. With such cages one can study the effect each species has on others. But they need to be removed afterwards rather than remaining a kind of scientific junk on the shore. Stainless steel bolts can lacerate bare feet. f050532: a common triplefin became one of the victims of a rocky shore study as the stones under which it lived or fled to, was thrown down or replaced carelessly. f032510: five porcelain crabs died by being crushed. A red-mouthed scavenging whelk is already on its way.